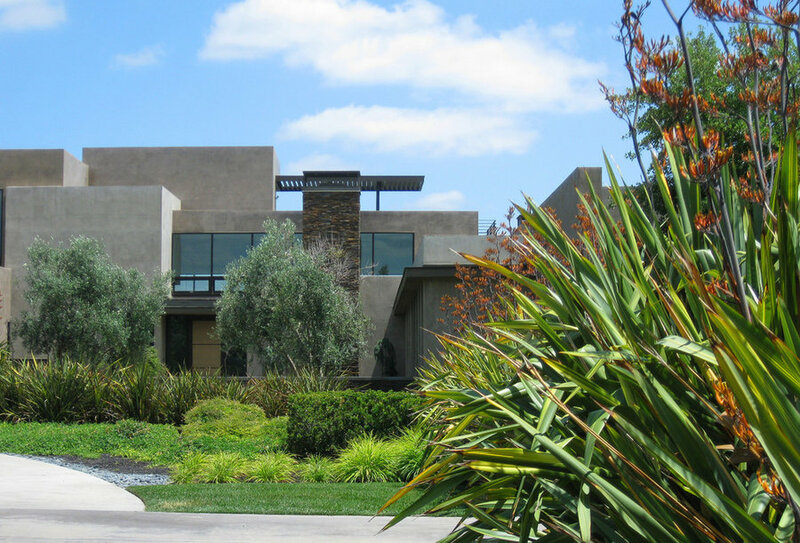 Guests enter the property down a long drive which terminates at a large circular drop-off area. 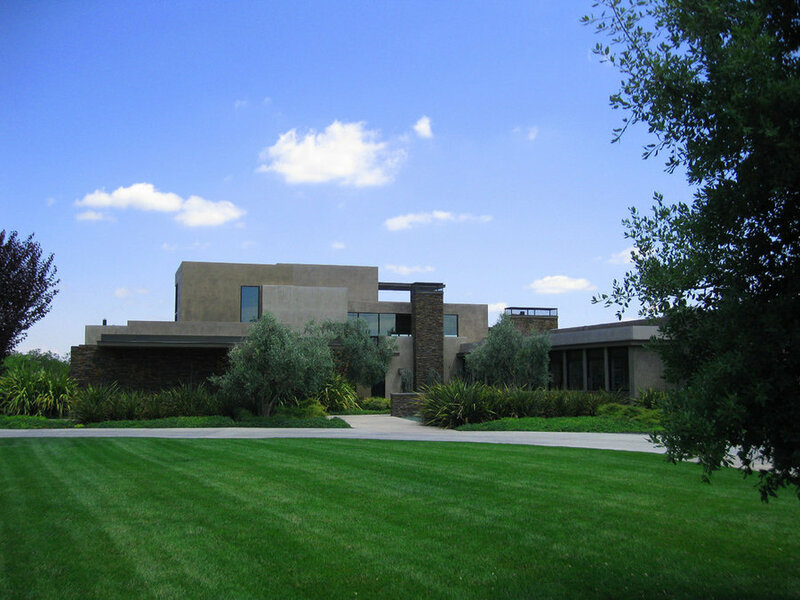 As they come around the bend in the drive, a view of the contemporary home unfolds in front of them. 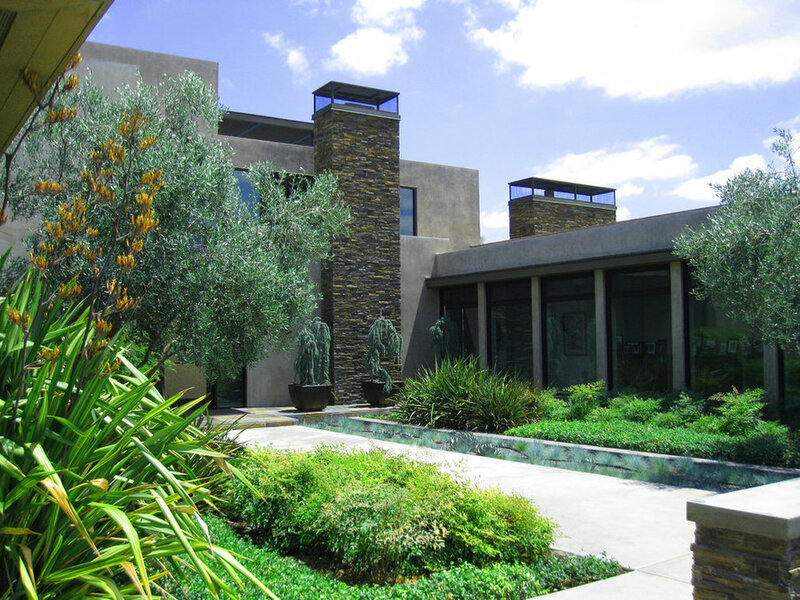 All of the plantings throughout the property were done in masses with a linear theme to complement the massing in the architecture. 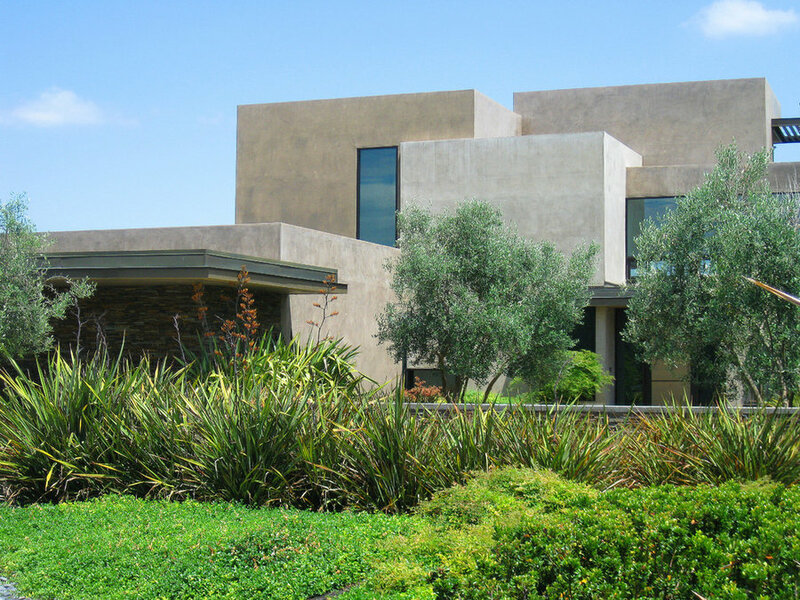 Visitors to the home travel to the front door through a staggered walk of overlapping rectangular concrete walks. The low stone wall begins on the inside of the house and shoots out into the lansdcape creating the connection between the architecture and the landscape. Visitors to the home travel to the front door through a staggered walk of overlapping rectangular concrete walks. 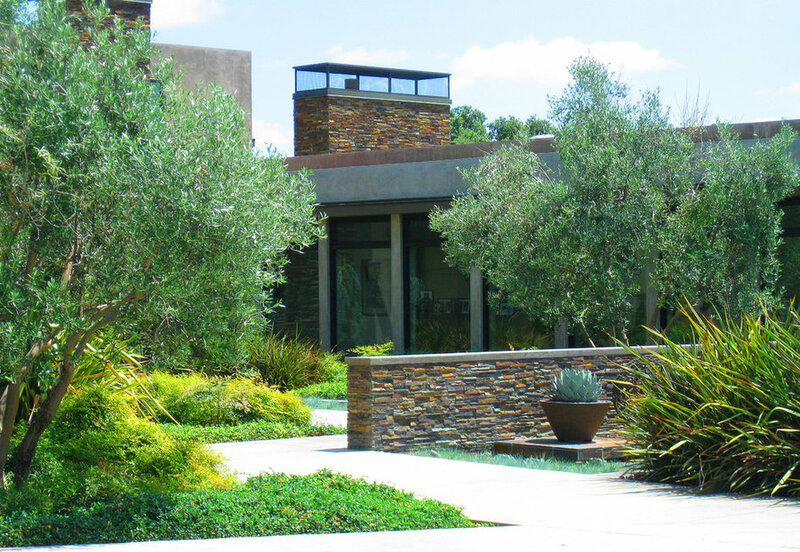 The linear windows in the home look out onto the entry courtyard space. 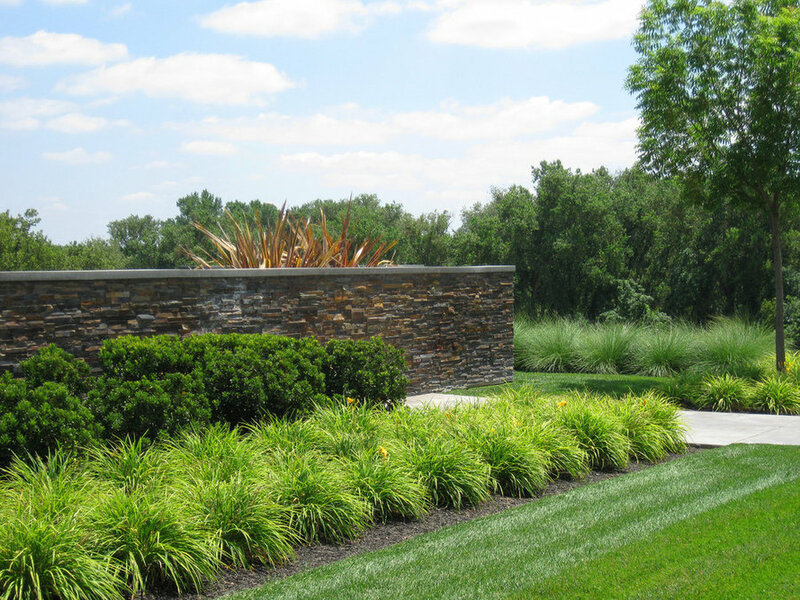 A mock water feature with silver ornamental grasses and gravel follows the entry walk to the front door. 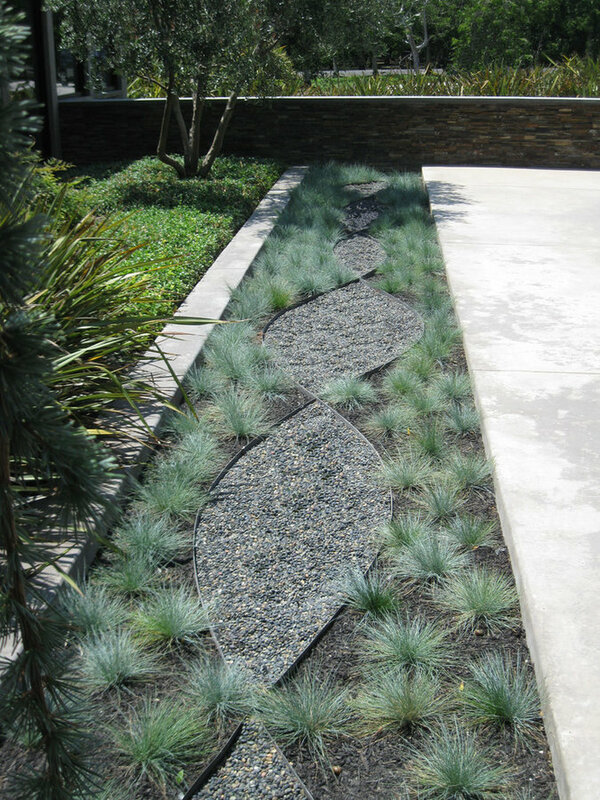 A styalized "water feature" using a meandering steel edging, decorative gravel, and Blue Fescue complements the front entry walk and courtyard space. 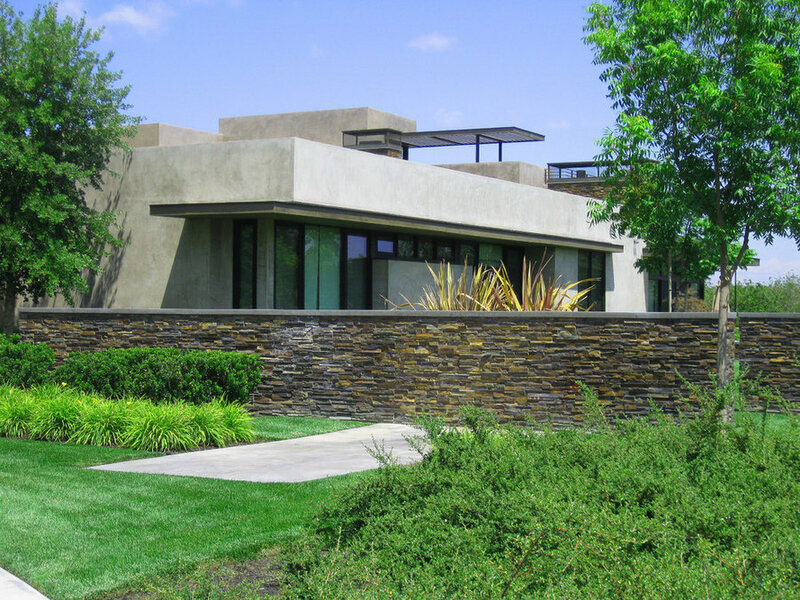 A medium height stone wall provides a separation from the front driveway and the more private backyard spaces. 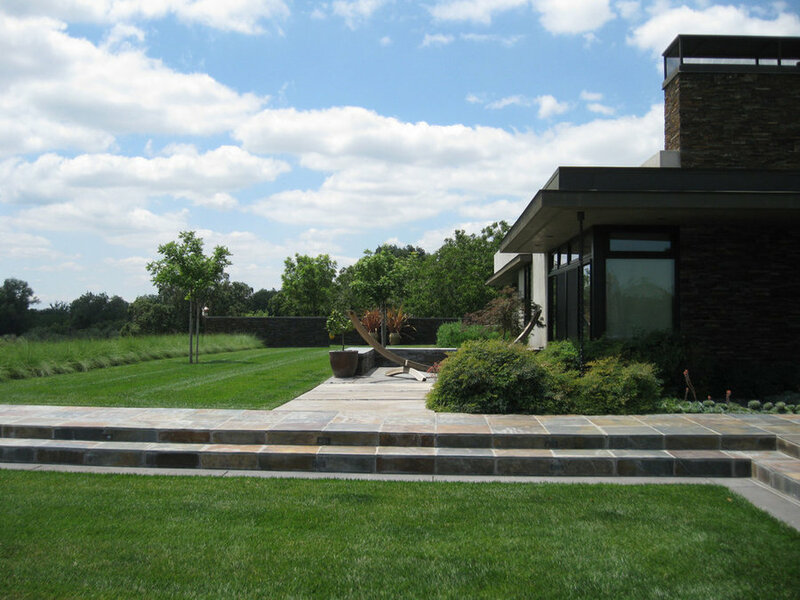 Rectangular concrete pads and linear mass plantings continue the contemporary feel of the landscape. Slate paving used throughout the interior is continued onto the exterior terraces strengthening the interior and exterior connection. Enjoying the fire pit area allows you to look back at the rear of the residence and the raised dining terrace. Slate paving used throughout the interior is continued onto the exterior terraces strengthening the interior and exterior connection. The architecture was inspired by mid-century detailing including the steel "spider leg" beams that extend out into the exterior creating a covered outdoor room. The pool terrace steps down from the main house level and continues the linear theme of the project. 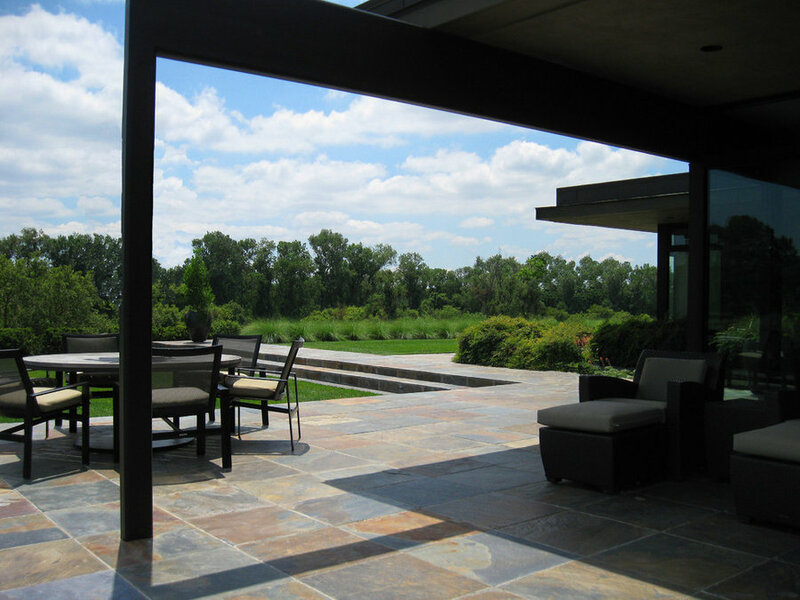 The exterior was set up with different outdoor rooms. A fire pit space is in the distance, the upper dining terrace is to the right. 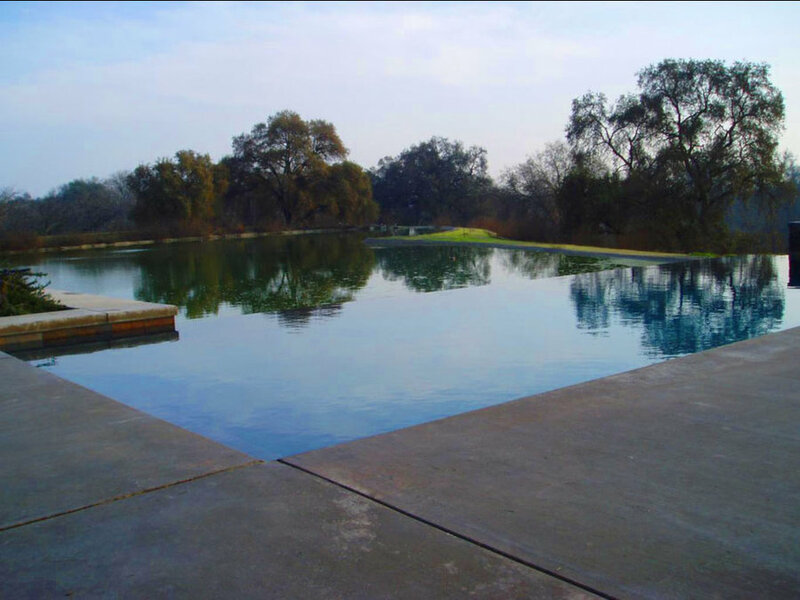 The beautiful view toward the lake beyond the infinity edge pool. 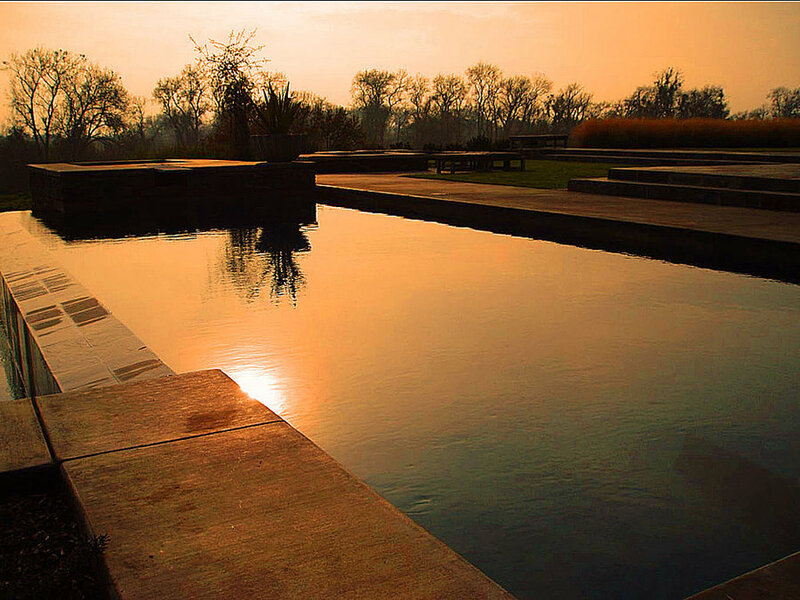 The native oak trees reflect in the still water of the lake and the pool. Slate paving used throughout the interior is continued onto the exterior terraces strengthening the interior and exterior connection. 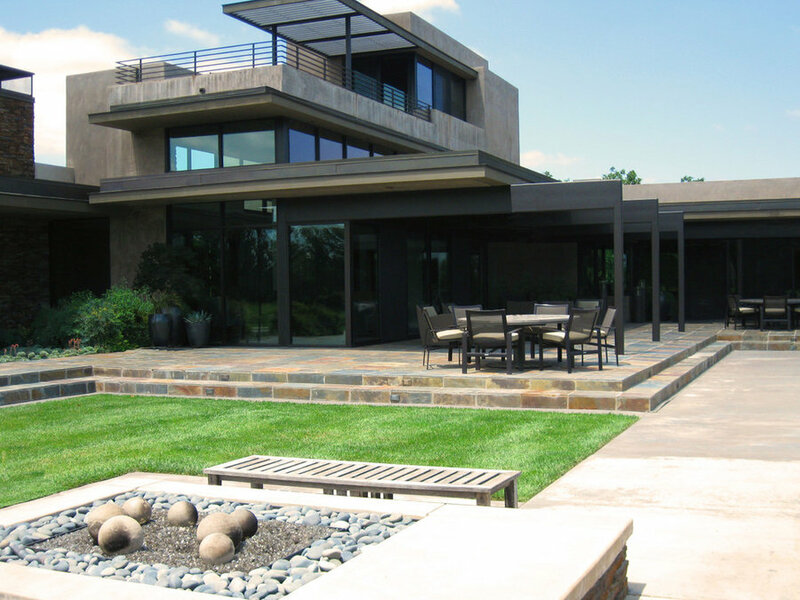 The architecture was inspired by mid-century detailing including the steel "spider leg" beams that extend out into the exterior creating a covered outdoor room. 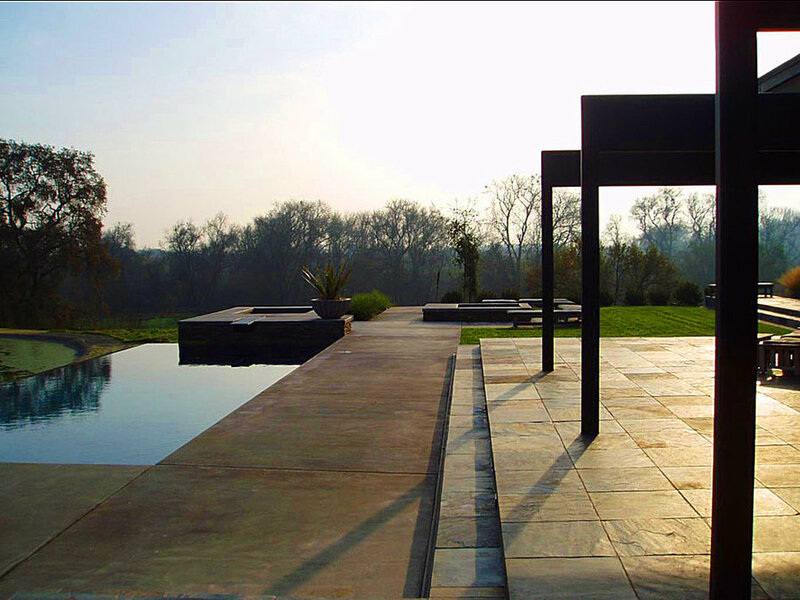 The infinity edge pool and the shooting linear concrete decking continues the eye out into the landcape further connecting the architecture with the site. Sunset View of the pool overlooking the bluff in the distance.